With a trio of scandals rocking the Obama administration, a dark cloud has descended over the White House in recent days. I am especially pleased that I had a chance to show them Soldier Field. I regret that I was not able to take in one of the Crosstown Classics, although I will note that my teams did okay. (Laughter.) Now — White Sox fan in the back. (Laughter.) Right on. As President, one of my top foreign policy priorities has been to strengthen our alliances, including NATO, and that’s exactly what we’ve done. Two years ago in Lisbon, we took action in several areas that are critical to the future of our alliance and we pledged that in Chicago we would do more. Over the last two days, we have delivered. Finally, NATO agreed to deepen its cooperation with partners that have been critical to alliance operations, as in Afghanistan and Libya. Today’s meeting was unprecedented, Our 28 allies, joined by 13 nations from around the world — Europe, the Middle East, North Africa and Asia. Each of these countries has contributed to NATO operations in different ways — military, political, financial — and each wants to see us do more together. To see the breadth of those countries represented in that room is to see how NATO has truly become a hub of global security. So again I want to thank all my fellow leaders. I think the bottom line is that we are leaving Chicago with a NATO alliance that is stronger, more capable and more ready for the future. As a result, each of our nations — the United States included — is more secure, and we’re in a stronger position to advance the security and prosperity and freedom that we seek around the world. Q Yes, thank you, Mr. President. Yesterday, your friend and ally, Cory Booker said that an ad that you released, that your campaign released was nauseating. And it alleged that Romney at Bain Capital was “responsible for job losses at a Kansas City steel mill.” Is that your view that Romney is personally responsible for those job losses? Will comments from Booker and your former auto czar Steve Rattner that have criticized some of these advertisements call on you to pull back a little bit? And, generally, can you give us your sense — three part, Mr. President. Could you give us your sense of just what private equity’s role is in stemming job losses as they seek a return on investment for their investors? Thank you. Q Just for — is Romney personally responsible for those 750 job losses? Hold on a second — Alister Bull. I’m not going to speculate on what happens if the Greek choose to exit because they’ve got an election and this is going to be an important debate inside of Greece. Everybody who was involved in the G8 summit indicated their desire to see Greece stay in the eurozone in a way that’s consistent with the commitments that it’s already — that have already been made. And I think it’s important for Greece, which is a democracy, to work through what their options are at time of great difficulty. I think we all understand, though, what’s at stake. What happens in Greece has an impact here in the United States. Businesses are more hesitant to invest if they see a lot of uncertainty looming across the Atlantic because they’re not sure whether that’s going to mean a further global slowdown. And we’re already seeing very slow growth rates and in fact contraction in a lot of countries in Europe. So we had an extensive discussion about how do we strengthen the European project generally in a way that does not harm world economic growth, but instead moves it forward. And I’ve been clear I think in — not just this week, but over the last two years about what I think needs to be done. We’ve got to put in place firewalls that ensure that countries outside of Greece that are doing the right thing aren’t harmed just because markets are skittish and nervous. And the good news was you saw a consensus across the board from newly elected President Hollande to Chancellor Merkel to other members of the European community that that balanced approach is what’s needed right now. They’re going to be meeting this week to try to advance those discussions further. We’ve offered to be there for consultation to provide any technical assistance and work through some of these ideas in terms of how we can stabilize the markets there. In fact, there’s still criticism about some of the decisions we made. But one of the things we were able to do was to act forcefully to solve a lot of these problems early, which is why credit markets that were locked up started loosening up again. That’s why businesses started investing again. That’s why we’ve seen job growth of over 4 million jobs over the last two years. That’s why corporations are making money and that’s why we’ve seen strong economic growth for a long time. We have established a strong counterterrorism partnership with the Yemeni government, but there’s no doubt that in a country that is still poor, that is still unstable, it is attracting a lot of folks that previously might have been in the FATA before we started putting pressure on them there. And we’re going to continue to work with the Yemeni government to try to identify AQAP leadership and operations and try to thwart them. That’s important for U.S. safety. It’s also important for the stability of Yemen and for the region. Q Thanks, Mr. President. I appreciate it. Yes, I put out an invitation for some troops and their families that I know and I’ll just give you two or three of them. Mr. President, if this handoff and withdrawal prove premature, what plans are in place for dealing with an Afghanistan that’s falling apart or is possibly again under Taliban rule? And I’ll just do one more, do you feel that the reporting you receive from the Pentagon fully represents what the on-ground commanders assess? Is there any disconnect between what leaders feel the public and President want to hear versus what is actually occurring on the ground? These are from troops I’ve met who served in Nuristan Province. THE PRESIDENT: Let me take the second question first. I mean, I think that one of the things that I emphasize whenever I’m talking to John Allen or the Joint Chiefs or any of the officers who are in Afghanistan is — I can’t afford a white wash. I can’t afford not getting the very best information in order to make good decisions. I should add, by the way, that the danger a lot of times is not that anybody is purposely trying to downplay challenges in Afghanistan. A lot of times it’s just the military culture is we can get it done. And so, their thinking is, how are we going to solve this problem, not boy, why is this such a disaster? That’s part of the reason why we admire our military so much and we love our troops, because they’ve got that can-do spirit. But think about it. We’ve been there now 10 years. We are now committing to a transition process that takes place next year, but the full transition to Afghan responsibility is almost two years away. And the Afghan Security Forces themselves will not ever be prepared if they don’t start taking that responsibility. And, frankly, the large footprint that we have in Afghanistan over time can be counterproductive. We’ve been there 10 years, and I think no matter how much good we’re doing and how outstanding our troops and our civilians and diplomats are doing on the ground, 10 years in a country that’s very different, that’s a strain not only on our folks but also on that country, which at a point is going to be very sensitive about its own sovereignty. Now, I think with respect to the protesters, as I said, this is part of what NATO defends, is free speech and the freedom of assembly. And, frankly, to my Chicago press, outside of Chicago, folks really weren’t all that stressed about the possibility about having some protesters here, because that’s what — part of what America is about. And obviously, Rahm was stressed, but he performed wonderfully and the Chicago police, Chicago’s finest, did a great job under some significant pressure and a lot of scrutiny. 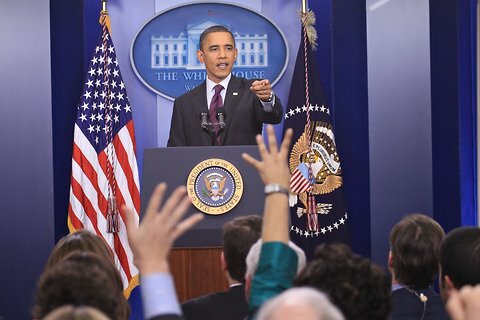 Doug Mills/The New York TimesPresident Obama held a news conference in the White House briefing room on Tuesday. President Obama held his first news conference of the year on Tuesday. We carried the play-by-play. Doug Mills/The New York TimesPresident Obama responding to questions from reporters at a news conference in Washington. 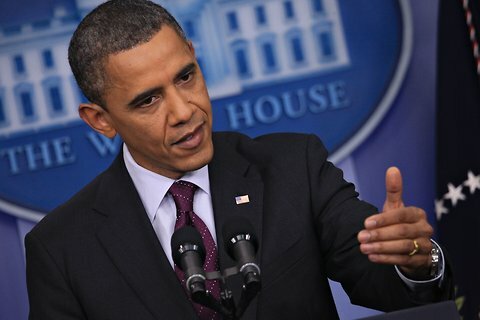 President Obama challenged his Republican critics to make a case to the American people for a military strike against Iran’s nuclear facilities if they really believe that is the right course to follow, throwing down an election-year challenge to the men who are vying to succeed him and who say that his Iran policy has been too weak. 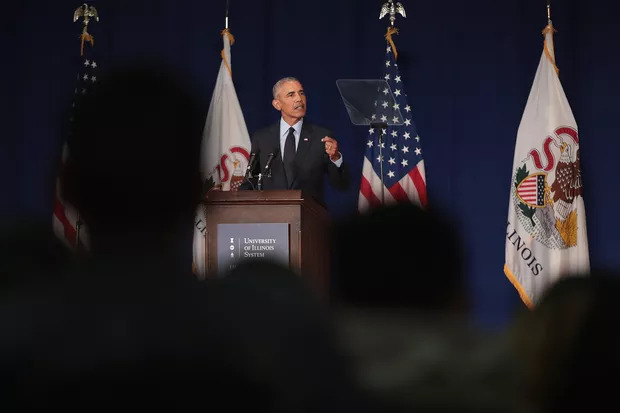 “This is not a game,” Mr. Obama said during a news conference at the White House timed to coincide with Super Tuesday voting in the Republican primaries in a number of crucial states. Mr. Obama gave a staunch defense of his administration’s actions to rein in Iran’s nuclear ambitions and said that tough sanctions put in place by the United States and Europe were starting to work and were part of the reason Iran had returned to the negotiation table. THE PRESIDENT: Good afternoon, everybody. Now, I understand there are some political contests going on tonight, but I thought I’d start the day off by taking a few questions, which I’m sure will not be political in nature. (Laughter.) Before I do, I want to make a few announcements about some steps we’re taking to help responsible homeowners who’ve been struggling through this housing crisis. We’ve clearly seen some positive economic news over the last few months. Businesses have created about 3.7 million new jobs over the last two years. Manufacturers are hiring for the first time since the 1990s. The auto industry is back and hiring more than 200,000 people over the last few years. Confidence is up. And the economy is getting stronger. But there are still millions of Americans who can’t find a job. There are millions more who are having a tough time making the rent or the mortgage, paying for gas or groceries. So our job in Washington isn’t to sit back and do nothing. And it’s certainly not to stand in the way of this recovery. Right now we’ve got to do everything we can to speed it up. Now, Congress did the right thing when they passed part of my jobs plan and prevented a tax hike on 160 million working Americans this year. And that was a good first step. But it’s not enough. They can’t just stop there and wait for the next election to come around. There are a few things they can do right now that could make a real difference in people’s lives. This Congress should, once and for all, end tax breaks for companies that are shipping jobs overseas, and use that money to reward companies that are creating jobs here in the United States. I’ve put forward a proposal that does just that, and there’s no reason why Congress can’t come together and start acting on it. This Congress could hold a vote on the Buffett Rule so that we don’t have billionaires paying a lower tax rate than their secretaries. That’s just common sense. The vast majority of Americans believe it’s common sense. And if we’re serious about paying down our deficit, it’s as good a place to start as any. And finally, this Congress should pass my proposal to give every responsible homeowner a chance to save an average of $3,000 a year by refinancing their mortgage at historically low rates. No red tape. No runaround from the banks. If you’ve been on time on your payments, if you’ve done the right thing, if you’ve acted responsibly, you should have a chance to save that money on your home — perhaps to build up your equity, or just to have more money in your pocket that you can spend on businesses in your community. That would make a huge difference for millions of American families. Now, if Congress refuses to act, I’ve said that I’ll continue to do everything in my power to act without them. Last fall, we announced an initiative that allows millions of responsible homeowners to refinance at low interest rates. Today we’re taking it a step further — we are cutting by more than half the refinancing fees that families pay for loans ensured by the Federal Housing Administration. That’s going to save the typical family in that situation an extra $1,000 a year, on top of the savings that they’d also receive from refinancing. That would make refinancing even more attractive to more families. It’s like another tax cut that will put more money in people’s pockets. We’re going to do this on our own. We don’t need congressional authorization to do it. We’re also taking a series of steps to help homeowners who have served our country. It is unconscionable that members of our armed forces and their families have been some of those who have been most susceptible to losing their homes due to the actions of unscrupulous banks and mortgage lenders. Over the last few years that happened — a lot. So as part of the landmark settlement we reached with some of the nation’s largest banks a few weeks ago, here’s what we’re going to do: If you are a member of the armed forces whose home was wrongfully foreclosed, you will be substantially compensated for what the bank did to you and your family. If you are a member of the armed forces with a high interest rate who was wrongfully denied the chance to lower it while you were in active serve, which banks are required to do by law, the banks will refund you the money you would have saved along with a significant penalty. The settlement will make sure that you aren’t forced into foreclosure just because you have a permanent change in station but can’t sell your home because you owe more than it’s worth. Some of the money will also go into a fund that guarantees loans on favorable terms to our veterans, and there will be more foreclosure protections for every man and woman who is currently serving this country in harm’s way. As I’ve said before, no amount of money is going to be enough to make it right for a family who has had their piece of the American Dream wrongfully taken away from them, and no action — no matter how meaningful — will entirely heal our housing market on its own. This is not something the government by itself can solve. But I’m not one of those people who believe that we should just sit by and wait for the housing market to hit bottom. There are real things that we can do right now that would make a substantial difference in the lives of innocent, responsible homeowners. That’s true in housing, and that’s true in any number of different areas when it comes to ensuring that this recovery touches as many lives as possible. That’s going to be my top priority as long as I hold this office, and I will do everything I can to make that progress. So with that I’m going to take some questions, and I will start with Mike Viqueira. Q Yes, sir. On the Middle East and as it relates to American politics, a little less than a year ago Moammar Qaddafi gave a speech, and he said he was going to send his forces to Benghazi, he was going to rout opponents from their bedrooms and he was going to shoot them. You frequently cited that speech as a justification for NATO, the no-fly zone and military action against Libya. In Syria, Bashar al Assad is killing people. There’s a massacre underway. And your critics here in the United States, including, most notably, John McCain, said you should start air strikes now. And on Iran, Mitt Romney, on Sunday, went so far as to say that if you are re-elected, Iran will get a bomb and the world will change. How do you respond to those criticisms? THE PRESIDENT: All right, Mike, you’ve asked a couple of questions there, so let me — let’s start with the Iran situation since that’s been the topic in the news for the last few days. When I came into office, Iran was unified, on the move, had made substantial progress on its nuclear program, and the world was divided in terms of how to deal with it. What we’ve been able to do over the last three years is mobilize unprecedented, crippling sanctions on Iran. Iran is feeling the bite of these sanctions in a substantial way. The world is unified; Iran is politically isolated. And what I have said is, is that we will not countenance Iran getting a nuclear weapon. My policy is not containment; my policy is to prevent them from getting a nuclear weapon — because if they get a nuclear weapon that could trigger an arms race in the region, it would undermine our non-proliferation goals, it could potentially fall into the hands of terrorists. And we’ve been in close consultation with all our allies, including Israel, in moving this strategy forward. At this stage, it is my belief that we have a window of opportunity where this can still be resolved diplomatically. That’s not just my view. That’s the view of our top intelligence officials; it’s the view of top Israeli intelligence officials. 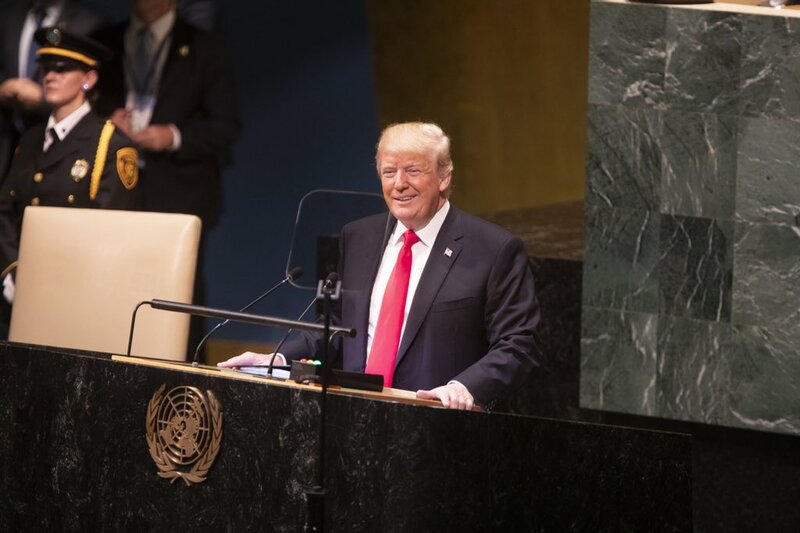 And, as a consequence, we are going to continue to apply the pressure even as we provide a door for the Iranian regime to walk through where they could rejoin the community of nations by giving assurances to the international community that they’re meeting their obligations and they are not pursuing a nuclear weapon. That’s my track record. Now, what’s said on the campaign trail — those folks don’t have a lot of responsibilities. They’re not Commander-in-Chief. And when I see the casualness with which some of these folks talk about war, I’m reminded of the costs involved in war. I’m reminded that the decision that I have to make in terms of sending our young men and women into battle, and the impacts that has on their lives, the impact it has on our national security, the impact it has on our economy. Now, the one thing that we have not done is we haven’t launched a war. If some of these folks think that it’s time to launch a war, they should say so. And they should explain to the American people exactly why they would do that and what the consequences would be. Everything else is just talk. Q That goes to Syria as well? THE PRESIDENT: With respect to Syria, what’s happening in Syria is heartbreaking and outrageous, and what you’ve seen is the international community mobilize against the Assad regime. And it’s not a question of when Assad leaves — or if Assad leaves — it’s a question of when. He has lost the legitimacy of his people. And the actions that he’s now taking against his own people is inexcusable, and the world community has said so in a more or less unified voice. On the other hand, for us to take military action unilaterally, as some have suggested, or to think that somehow there is some simple solution, I think is a mistake. What happened in Libya was we mobilized the international community, had a U.N. Security Council mandate, had the full cooperation of the region, Arab states, and we knew that we could execute very effectively in a relatively short period of time. This is a much more complicated situation. So what we’ve done is to work with key Arab states, key international partners — Hillary Clinton was in Tunisia — to come together and to mobilize and plan how do we support the opposition; how do we provide humanitarian assistance; how do we continue the political isolation; how do we continue the economic isolation. And we are going to continue to work on this project with other countries. And it is my belief that, ultimately, this dictator will fall, as dictators in the past have fallen. But the notion that the way to solve every one of these problems is to deploy our military, that hasn’t been true in the past and it won’t be true now. We’ve got to think through what we do through the lens of what’s going to be effective, but also what’s critical for U.S. security interests. Q Thank you, Mr. President. What kind of assurances did you give Prime Minister Netanyahu about the role that the U.S. would play if diplomacy and economic sanctions fail to work to convince Iran’s leaders to change their behavior, and Israel goes ahead and prepares to strike a nuclear facility? What kind of assurances did you tell him? And shouldn’t we — I recognize the difference between debate and bluster — but shouldn’t we be having in this country a vigorous debate about what could happen in the case of a Middle East war in a way that, sadly, we did not do before going into Iraq? THE PRESIDENT: Well, I think there’s no doubt that those who are suggesting, or proposing, or beating the drums of war should explain clearly to the American people what they think the costs and benefits would be. I’m not one of those people — because what I’ve said is, is that we have a window through which we can resolve this issue peacefully. We have put forward an international framework that is applying unprecedented pressure. The Iranians just stated that they are willing to return to the negotiating table. And we’ve got the opportunity, even as we maintain that pressure, to see how it plays out. I’m not going to go into the details of my conversation with Prime Minister Netanyahu. But what I said publicly doesn’t differ greatly from what I said privately. Israel is a sovereign nation that has to make its own decisions about how best to preserve its security. And as I said over the last several days, I am deeply mindful of the historical precedents that weigh on any Prime Minister of Israel when they think about the potential threats to Israel and the Jewish homeland. What I’ve also said is that because sanctions are starting to have significant effect inside of Iran — and that’s not just my assessment, that’s, I think, a uniform assessment — because the sanctions are going to be even tougher in the coming months, because they’re now starting to affect their oil industry, their central bank, and because we’re now seeing noises about them returning to the negotiating table, that it is deeply in everybody’s interests — the United States, Israel and the world’s — to see if this can be resolved in a peaceful fashion. And so this notion that somehow we have a choice to make in the next week or two weeks, or month or two months, is not borne out by the facts. And the argument that we’ve made to the Israelis is that we have made an unprecedented commitment to their security. There is an unbreakable bond between our two countries, but one of the functions of friends is to make sure that we provide honest and unvarnished advice in terms of what is the best approach to achieve a common goal — particularly one in which we have a stake. This is not just an issue of Israeli interest; this is an issue of U.S. interests. It’s also not just an issue of consequences for Israel if action is taken prematurely. There are consequences to the United States as well. And so I do think that any time we consider military action that the American people understand there’s going to be a price to pay. Sometimes it’s necessary. But we don’t do it casually. When I visit Walter Reed, when I sign letters to families that haven’t — whose loved ones have not come home, I am reminded that there is a cost. Sometimes we bear that cost. But we think it through. We don’t play politics with it. When we have in the past — when we haven’t thought it through and it gets wrapped up in politics, we make mistakes. And typically, it’s not the folks who are popping off who pay the price. It’s these incredible men and women in uniform and their families who pay the price. And as a consequence, I think it’s very important for us to take a careful, thoughtful, sober approach to what is a real problem. And that’s what we’ve been doing over the last three years. That’s what I intend to keep doing. Q You might not be beating the drums of war, but you did very publicly say, we’ve got Israel’s back. What does that mean? THE PRESIDENT: What it means is, is that, historically, we have always cooperated with Israel with respect to the defense of Israel, just like we do with a whole range of other allies — just like we do with Great Britain, just like we do with Japan. And that broad statement I think is confirmed when you look at what we’ve done over the last three years on things like Iron Dome that prevents missiles from raining down on their small towns along border regions of Israel, that potentially land on schools or children or families. And we’re going to continue that unprecedented security — security commitment. It was not a military doctrine that we were laying out for any particular military action. It was a restatement of our consistent position that the security of Israel is something I deeply care about, and that the deeds of my administration over the last three years confirms how deeply we care about it. That’s a commitment we’ve made. Jackie. Where’s Jackie? There you are. Q With the news this morning that the U.S. and its allies are returning to the table, are taking up Iran’s offer to talk again, more than a year after those talks broke up in frustration, is this Israel’s — Iran’s last chance to negotiate an end to this nuclear question? And you said three years ago — nearly three years ago, in a similar one-on-one meeting with Prime Minister Netanyahu, that the time for talk — by the end of that year, 2009, you would be considering whether Iran was negotiating in good faith. And you said at that time that “we’re not going to have talks forever.” So here we are nearly three years later. Is this it? And did you think you would be here three years after those first talks? THE PRESIDENT: You know, there is no doubt that over the last three years when Iran has engaged in negotiations there has been hemming and hawing and stalling and avoiding the issues in ways that the international community has concluded were not serious. And my expectations, given the consequences of inaction for them, the severe sanctions that are now being applied, the huge toll it’s taking on their economy, the degree of isolation that they’re feeling right now — which is unprecedented — they understand that the world community means business. To resolve this issue will require Iran to come to the table and discuss in a clear and forthright way how to prove to the international community that the intentions of their nuclear program are peaceful. They know how to do that. This is not a mystery. And so it’s going to be very important to make sure that, on an issue like this — there are complexities; it obviously has to be methodical. I don’t expect a breakthrough in a first meeting, but I think we will have a pretty good sense fairly quickly as to how serious they are about resolving the issue. And there are steps that they can take that would send a signal to the international community and that are verifiable, that would allow them to be in compliance with international norms, in compliance with international mandates, abiding by the non-proliferation treaty, and provide the world an assurance that they’re not pursuing a nuclear weapon. They know how to do it, and the question is going to be whether in these discussions they show themselves moving clearly in that direction. Q Thank you, Mr. President. I wanted to follow up on Israel and Iran because you have said repeatedly you have Israel’s back. And so I wonder why, three years in office, you have not visited Israel as President. And related to Iran and Israel, you have expressed concern about this loose talk of war, as you call it, driving up gas prices further. Your critics will say on Capitol Hill that you want gas prices to go higher because you have said before, that will wean the American people off fossil fuels, onto renewable fuels. How do you respond to that? THE PRESIDENT: Ed, just from a political perspective, do you think the President of the United States going into reelection wants gas prices to go up higher? (Laughter.) Is that — is there anybody here who thinks that makes a lot of sense? Look, here’s the bottom line with respect to gas prices. I want gas prices lower because they hurt families; because I meet folks every day who have to drive a long way to get to work and them filling up this gas tank gets more and more painful, and it’s a tax out of their pocketbooks, out of their paychecks, and a lot of folks are already operating on the margins right now. And it’s not good for the overall economy, because when gas prices go up, consumer spending oftentimes pulls back. And we’re in the midst right now of a recovery that is starting to build up steam, and we don’t want to reverse it. What I have also said about gas prices is that there is no silver bullet and the only way we’re going to solve this problem over the medium and long term is with an all-of-the-above strategy that says we’re going to increase production — which has happened; we are going to make sure that we are conserving energy — that’s why we doubled fuel efficiency standards on cars, which will save consumers about $1.7 trillion and take about 12 billion barrels of oil offline, which will help to reduce prices — and we’re going develop clean energy technologies that allow us to continue to use less oil. And we’ve made progress. I mean, the good news is, 2010, first time in a decade that our oil imports were actually below 50 percent, and they have kept on going down. And we’re going to keep on looking at every strategy we can to, yes, reduce the amount of oil that we use, while maintaining our living standards and maintaining our productivity and maintaining our economic growth, and we’re going to do everything we can to make sure that consumers aren’t hurt by it. Now, there are some short-term steps that we’re looking at with respect to — for example, there are certain potential bottlenecks in refineries around the country that we’ve been concerned about. We’re concerned about what’s happening in terms of production around the world. It’s not just what’s happening in the Gulf. You’ve had, for example, in Sudan, some oil that’s been taken offline that’s helping to restrict supply. So we’re going to look at a whole range of measures — including, by the way, making sure that my Attorney General is paying attention to potential speculation in the oil markets. I’ve asked him to reconstitute a task force that’s examining that. But we go through this every year. We’ve gone through this for 30 years. And if we are going to be competitive, successful, and make sure families are protected over the long term, then we’ve got to make sure that we’ve got a set of options that reduce our overall dependence on oil. And with respect to Israel, I am not the first President who has been unable, because of a whole range of issues, not to visit Israel as President in their first term. I visited Israel twice as senator, once right before I became President. The measure of my commitment to Israel is not measured by a single visit. The measure of my commitment to Israel is seen in the actions that I’ve taken as President of the United States. And it is indisputable that I’ve had Israel’s back over the last three years. Q Thank you, Mr. President. Do you believe Rush Limbaugh’s apology to the Georgetown law student was sufficient and heartfelt? Do you agree with the decision of the growing number of sponsors that have decided to drop his show or stop supporting his show? And has there been a double standard on this issue? Liberal commentators have made similarly provocative or distasteful statements and there hasn’t been such an outrage. THE PRESIDENT: I’m not going to comment on what sponsors decide to do. I’m not going to comment on either the economics or the politics of it. I don’t know what’s in Rush Limbaugh’s heart, so I’m not going to comment on the sincerity of his apology. What I can comment on is the fact that all decent folks can agree that the remarks that were made don’t have any place in the public discourse. And the reason I called Ms. Fluke is because I thought about Malia and Sasha, and one of the things I want them to do as they get older is to engage in issues they care about, even ones I may not agree with them on. I want them to be able to speak their mind in a civil and thoughtful way. And I don’t want them attacked or called horrible names because they’re being good citizens. And I wanted Sandra to know that I thought her parents should be proud of her, and that we want to send a message to all our young people that being part of a democracy involves argument and disagreements and debate, and we want you to be engaged, and there’s a way to do it that doesn’t involve you being demeaned and insulted, particularly when you’re a private citizen. Q Bill Mahr apologized for what he said about — (inaudible) — should apologize for what they said about that? Q Top Democrats have said that Republicans on a similar issue are engaged in a war on women. Some top Republicans say it’s more like Democrats are engaged in a war for the women’s vote. As you talk about loose talk of war in another arena and women are — this could raise concerns among women, do you agree with the chair of your Democratic National Committee that there is a war on women? And there are millions of strong women around the country who are going to make their own determination about a whole range of issues. It’s not going to be narrowly focused just on contraception. It’s not going to be driven by one statement by one radio announcer. It is going to be driven by their view of what’s most likely to make sure they can help support their families, make their mortgage payments; who’s got a plan to ensure that middle-class families are secure over the long term; what’s most likely to result in their kids being able to get the education they need to compete. THE PRESIDENT: And what I do is I practice it. And so I’m going to try to lead by example in this situation, as opposed to commenting on every single comment that’s made by either politicians or pundits. I would be very busy. I would not have time to do my job. That’s your job, to comment on what’s said by politicians and pundits. Q Mr. President, polls are showing that Latino voters seem to be favoring your reelection over a Republican alternative. Yet some of them are still disappointed, others have said, about a promise that you’ve made on immigration reform that has yet to come to pass. If you are reelected, what would be your strategy, what would you do different to get immigration reform passed through the Congress, especially if both houses continue as they are right now, which is split? THE PRESIDENT: Well, first of all, just substantively, every American should want immigration reform. We’ve got a system that’s broken. We’ve got a system in which you have millions of families here in this country who are living in the shadows, worried about deportation. You’ve got American workers that are being undercut because those undocumented workers can be hired and the minimum wage laws may not be observed, overtime laws may not be observed. You’ve got incredibly talented people who want to start businesses in this country or to work in this country, and we should want those folks here in the United States. But right now, the legal immigration system is so tangled up that it becomes very difficult for them to put down roots here. So we can be a nation of laws and a nation of immigrants. And it is not just a Hispanic issue — this is an issue for everybody. This is an American issue that we need to fix. Now, when I came into office I said I am going to push to get this done. We didn’t get it done. And the reason we haven’t gotten it done is because what used to be a bipartisan agreement that we should fix this ended up becoming a partisan issue. I give a lot of credit to my predecessor, George Bush, and his political advisors who said this should not be just something the Democrats support; the Republican Party is invested in this as well. That was good advice then; it would be good advice now. And my hope is, is that after this election, the Latino community will have sent a strong message that they want a bipartisan effort to pass comprehensive immigration reform that involves making sure we’ve got tough border security — and this administration has done more for border security than just about anybody — that we are making sure that companies aren’t able to take advantage of undocumented workers; that we’ve got strong laws in place; and that we’ve got a path so that all those folks whose kids often are U.S. citizens, who are working with us, living with us and in our communities, and not breaking the law, and trying to do their best to raise their families, that they’ve got a chance to be a fuller part of our community. So, what do I think will change? Q What would you do differently? THE PRESIDENT: What I will do — look, we’re going to be putting forward, as we’ve done before, a framework, a proposal, legislation that can move it — move the ball forward and actually get this thing done. But ultimately, I can’t vote for Republicans. They’re going to have to come to the conclusion that this is good for the country and that this is something that they themselves think is important. And depending on how Congress turns out, we’ll see how many Republican votes we need to get it done. Norah O’Donnell. How are you? Q Thank you, Mr. President. Today is Super Tuesday, so I wonder if you might weigh in on some of your potential Republican opponents. Mitt Romney has criticized you on Iran and said, “Hope is not a foreign policy.” He also said that you are “America’s most feckless President since Carter.” What would you like to say to Mr. Romney? Q My question is about the switch of the G8 summit from Chicago to Camp David. A reason given from the White House is that now you wanted a more intimate summit. People of Chicago would like to know what do you know now that you did not know when you booked hometown Chicago for the G8 that led to the switch? And what role did security threats possibly play in the decision? THE PRESIDENT: Well, keep in mind, Lynn, we’re still going to be showing up with a whole bunch of world leaders. We’ve got this NATO summit. Typically what’s happened is, is that we try to attach the G8 summit to the NATO summit so that the leaders in the G8 summit don’t have to travel twice to whatever location. So last year, in France, we combined a G8 with a NATO summit. We’ll do so again. All right? Okay. Go ahead, last one, last question. Q Thank you. Mr. President, just to continue on that — when the NATO leaders gather in Chicago in May, do you expect that they’ll be able to agree on a transition strategy? And are you concerned at all that the Koran burning and the episodes that have followed since then threaten your ability to negotiate with partners? THE PRESIDENT: Well, keep in mind that the transition policy was in place and established at Lisbon, and we’ve been following that strategy that calls for us turning over increasing responsibility to Afghans and a full transition so that our combat role is over by the end of 2014. And our coalition partners have agreed to it. They are sticking with it. That continues to be the plan. What we are now going to be doing over the next — at this NATO meeting and planning for the next two years, is to make sure that that transition is not a cliff, but that there are benchmarks and steps that are taken along the way, in the same way that we reduced our role in Iraq so that it is gradual, Afghan capacity is built, the partnering with Afghan security forces is effective, that we are putting in place the kinds of support structures that are needed in order for the overall strategy to be effective. Now, yes, the situation with the Koran burning concerns me. I think that it is an indication of the challenges in that environment, and it’s an indication that now is the time for us to transition. Obviously, the violence directed at our people is unacceptable. And President Karzai acknowledged that. But what is also true is President Karzai I think is eager for more responsibility on the Afghan side. We’re going to be able to find a mechanism whereby Afghans understand their sovereignty is being respected and that they’re going to be taking a greater and greater role in their own security. That I think is in the interest of Afghans. It’s also in our interests. And I’m confident we can execute, but it’s not going to be a smooth path. There are going to be bumps along the road just as there were in Iraq. Q Well, are these bumps along the road, or are you seeing a deterioration in the relationship, based on the Koran burning itself, the violence that has followed, that inhibits your ability to work out things like how to hand off the detention center? THE PRESIDENT: No, I — none of this stuff is easy, and it never has been. And obviously, the most recent riots or protests against the Koran burning were tragic, but remember, this happened a while back when a pastor in Florida threatened to burn a Koran. In Iraq, as we were making this transition, there were constant crises that would pop up and tragic events that would take place and there would be occasional setbacks. But what I’ve tried to do is to set a course, make sure that up and down the chain of command everybody knows what our broader strategy is. And one of the incredible things about our military is that when they know what our objective is, what our goal is, regardless of the obstacles that they meet along the way, they get the job done. And I think that President Karzai understands that we are interested in a strategic partnership with the Afghan people and the Afghan government. We are not interested in staying there any longer than is necessary to assure that al Qaeda is not operating there, and that there is sufficient stability that it doesn’t end up being a free-for-all after ISAF has left. And so we share interests here. It will require negotiations, and there will be time where things don’t look as smooth as I’d like. That’s kind of the deal internationally on a whole range of these issues. Oh, can I just make one other comment? I want to publicly express condolences to the family of Donald Payne, Congressman from New Jersey — a wonderful man; did great work, both domestically and internationally. He was a friend of mine. And so my heart goes out to his family and to his colleagues. In the State of the Union, President Obama introduced a basic principle: Every homeowner who is current on his or her payments ought to have a chance to refinance their mortgage at today’s historically low rates. To make that idea a reality for everyone, Congress must take action. But today, the President is taking another step to make refinancing easier for millions of Americans who have government-sponsored mortgages. He’s cutting fees — to help families save money and make refinancing more attractive. And at a press conference that just wrapped up, President Obama announced a series of steps aimed at helping homeowners who have served in the Armed Forces. When the nation’s five largest mortgage servicers reached a settlement with the federal government and 49 state attorneys general, they agreed to provide substantial relief to the nation’s veterans who were victims of wrongful foreclosures or who were otherwise disadvantaged in the mortgage process because of the obligations of their service. Finally, under the settlement, the banks will also pay $10 million into the Veterans Housing Benefit Program Fund, which guarantees loans on favorable terms for service members. To learn more, check out the full video from the press conference or read the transcript.